‍REP. DINA TITUS (D-NV) INTRODUCES GLOBE ACT TO PROTECT LGBTQ PEOPLE AROUND THE WORLD: “While Donald Trump and Mike Pence remain recklessly silent on anti-LGBTQ atrocities around the globe, it’s crucial that the United States Congress fill the void and make clear LGBTQ rights are human rights,” said HRC Government Affairs Director David Stacy (@david_stacy). "We thank Rep. Titus for her important leadership on this issue." More from HRC and Metro Weekly. NEXT WEEK -- We are expecting the first official report from the Organization for Security and Cooperation in Europe’s fact-finding mission into the horrific anti-LGBTQ human rights violations in Chechnya. HRC has worked to shine a spotlight on the dire situation in Chechnya through our #EyesOnChechnya campaign. HRC MOURNS REGINA DENISE BROWN, TRANSGENDER WOMAN OF COLOR KILLED IN SOUTH CAROLINA: Brown’s murder adds to the long list of trans deaths reported in the U.S. In 2018, at least 26 transgender people have been killed. “[Brown] always was smiling and happy. She always gave encouragement to the younger trans women always highlighting our best features and strong traits. Just an all around great lady with a big heart,” a loved one told Sofia Lotto Persio (@sofiaellepi) at PinkNews. More from HRC. TRUMP-PENCE ADMINISTRATION IS DESPERATE TO DISCRIMINATE AGAINST TRANSGENDER TROOPS: After requesting that the U.S. Supreme Court hear arguments on the transgender troop ban, the Trump-Pence administration has now requested that the nation’s highest court allow them to implement the cruel and dangerous policy should the court refuse to prematurely take the case. More from CNN. FEEL GOOD FRIDAY -- JOE BIDEN’S ‘AS YOU ARE’ CAMPAIGN COLLECTS HUNDREDS OF STORIES OF LGBTQ LOVE AND ACCEPTANCE: One story features Steve Bennett and Robin Bacsfalvi, parents who share the journey of their transgender daughter, Rio. More from South Florida Gay News. GEORGIA SPEAKER OF THE HOUSE SIGNALS SKEPTICISM AROUND ANTI-LGBTQ LEGISLATION: David Ralston has expressed an unwillingness to pursue anti-LGBTQ measures when the Georgia legislature gavels in its new session, saying he has “serious concerns” about “license to discriminate” legislation. More from Project Q Atlanta. PITTSBURGH TRANS MAN SAYS HE WAS ATTACKED IN DOWNTOWN: Zahair Martinez alleges he was kicked, had hot coffee thrown in his eyes and verbally harassed inside a local 7-11. More from WTAE. NEW STUDY FROM NYC ANTI-VIOLENCE PROJECT LOOKS AT WORKPLACE ISSUES FACED BY TRANSGENDER AND GENDER NON-CONFORMING EMPLOYEES: More about the report, “Individual Struggles,Widespread Injustice,” from Fernanda Nunes in AM New York. MAN CHARGED WITH ASSAULT FOR ATTACKING WOMAN ON NYC SUBWAY: Allasheed Allah, 54, has been charged with assault as a hate crime and aggravated harassment as a hate crime. More from NBC. BEN HUNTE (@BenInLDN) NAMED FIRST LGBTQ CORRESPONDENT FOR BBC NEWS: More from BBC and GayTimes. COLUMBUS, OH, OPENS FIRST BEHAVIORAL HEALTH UNIT FOR LGBTQ PEOPLE: More from WOSU Radio. 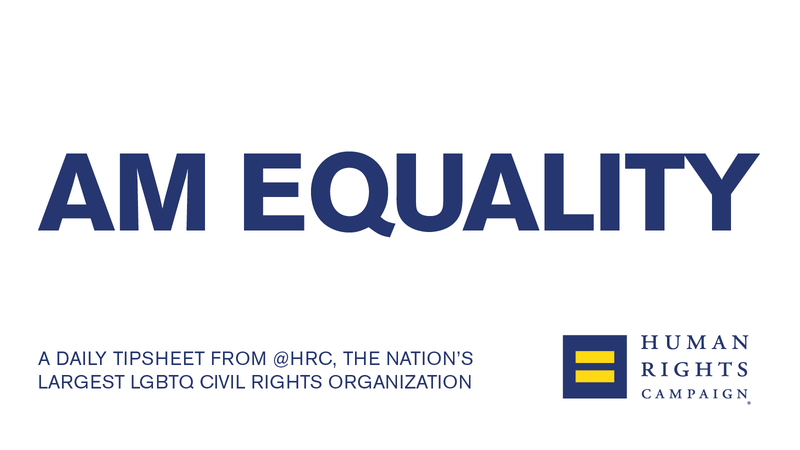 SHAMEFUL -- GOVERNMENT OF BERMUDA HAS APPEALED MARRIAGE EQUALITY DECISION TO PRIVY COURT: HRC is proud to support our allies and advocates in Bermuda, including OUTBermuda, who continue to fight the government’s opposition to marriage equality. TOP ISRAEL COURT RULES IN FAVOR OF ADOPTION RIGHTS FOR GAY COUPLE: More from Times of Israel. CHURCH OF ENGLAND APPROVES CLERGY GUIDANCE FOR WELCOMING TRANS CHRISTIANS: More from Newsweek.